Jarawa are one of the adivasi indigenous peoples of the Andaman Islands in India. Their present numbers are estimated at between 250–400 individuals. Since they have largely shunned interactions with outsiders, many particulars of their society, culture and traditions are poorly understood. 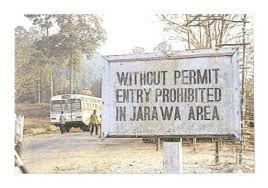 The Supreme Court in January 2013 banned tourists from taking the Andaman Nicobar Trunk Road that passes through the area where the Jarawas live. The road is used to reach the Limestone Cave. The court has already banned all commercial and tourism activities within a five-km radius of the Jarawa Tribal Reserve on the Andaman and Nicobar Islands.